A 12 volt refrigerator used to be something exclusive to boat owners, RVers, 18 wheel truck drivers, campers or for those who spent time in cabins without power. But not any longer! If you are looking to save energy in your home, your fridge can be charged by solar and wind power. A self powered at-home fridge is finally possible. Though why would you do this? They are quite useful in areas with severe weather and extended power outages. Hurricanes and tornadoes are the usual culprits, but just loosing power can cause complete food spoilage. 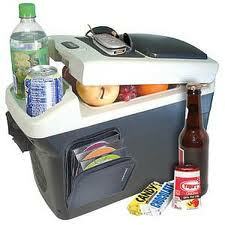 If plan on getting "off the grid" or even going on a road or boat trip, a 12 volt fridge is definitely the way to go. Car Refrigerators: The smallest versions of 12 volt fridges are made more for automotive use and are perfect options for those long road trips and tailgate parties. These units are powered by plugging them into a cigarette lighter/cell phone charger and they feed off the car's battery. One thing that is super cool if you have two separate seats upfront many of them fit perfectly in between. Take a look at the picture -- this one even comes with a CD case! They come in a variety of sizes -- some hold as little as a 6-pack of soda, and other larger models can store enough food for 3-4 people for a few days. The larger versions for RVs are actually built in refrigerators and fall more into the next category. The model shown above is more of a medium sized version. If you're looking for something more than a glorified beer cooler you will be happy to know that they do exist. Some models require a bit more stabilization than others –such as RV refrigerators. The larger the fridge is, you will need to be sure to find a way to lock it in place and keep it stable if it's used in something mobile (e.g., RV, boat, etc.). Tip: If you plan on having your 12 volt on your boat make sure it is made for that type of usage. A compressor for a regular refrigerator is made to work straight up and down but on a boat that isn’t always the case. 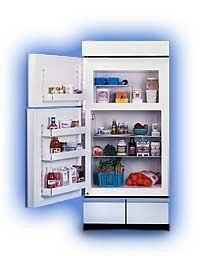 The constant motion adds a few variables that a marine refrigerator is built to handle. The marine refrigerator brands to check out are Indel Isotherm refrigerators and portable refrigerators by Waeco. All of these brands make refrigerators whose storage is measured in the number of liters it holds instead of cubic feet like in a more traditional fridge. FYI: These types can utilize a car battery as their sole means of power. Energy consumption wasn’t really a consideration. One great feature about most of these models is that with a simple flip of a switch you can turn them from a cooler into a warmer. If you are looking for a freezer or fridge that top loads then take a look at SunDanzer. If you are looking for a more energy efficient 12 volt refrigerator then look for one with thicker internal walls and increased insulation. If using a solar charger then pick one with a very good cooling system. Tip: Look for a refrigerator that uses thick walled lining as you'll only need to turn it on a few hours a day (5-6) to keep your food frozen. Most 12 volt refrigerators are powered by either external (car battery) or internal batteries. In order to maximize the life of the battery, it is recommended by a number of manufacturers to recharge these units before they deplete to less than half full. Tip: Avoid attaching your 12 volt fridge to a car battery for every day use. This will deplete it faster than you might expect and will dramatically lessen the life-span of your car's battery. However, since most diesel powered trucks, RVs or boat batteries are much stronger, you shouldn't have the same issue. As we mentioned above, be sure to recharge the fridge's battery before it becomes less than 50% full.